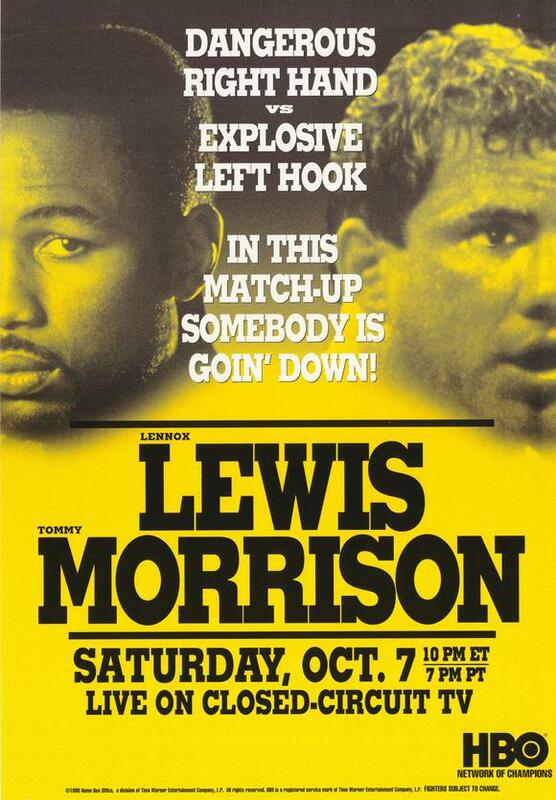 On October 7, 1995, top heavyweights Lennox Lewis and Tommy Morrison clashed at the Atlantic City Convention Center for Morrison’s IBC belt, though the title was a minor formality for two fighters who had experienced bigger levels of success — and failure. 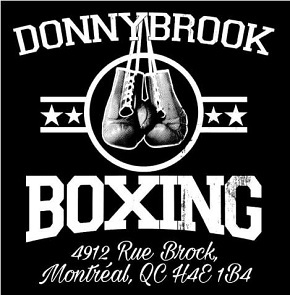 The bout was a thudding six round battle and a true crossroads match that effectively defined both fighters’ futures. For Lewis, it was an impressive performance that jump-started his reclamation of dominance. 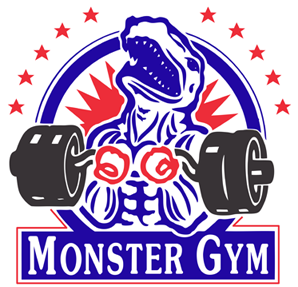 For Morrison, it was the last important bout of his career, which would soon be derailed by a bizarre health odyssey. At 45-2-1, Morrison had a wealth of ring experience by this time. 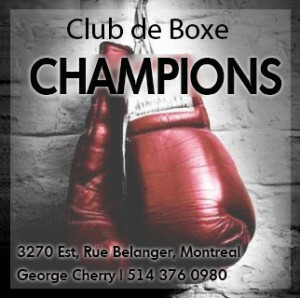 He had won the vacant WBO title in his bout with a 45-year-old George Foreman in 1993, only to lose it in his second defense against Michael Bentt. 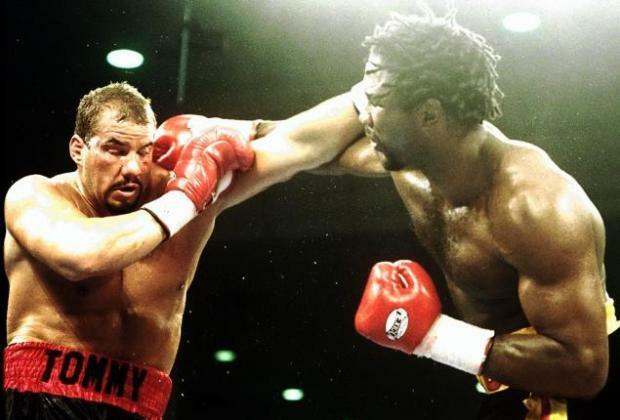 He rebounded with seven wins prior to his bout with Lewis, his last a thrilling six round stoppage over Razor Ruddock. 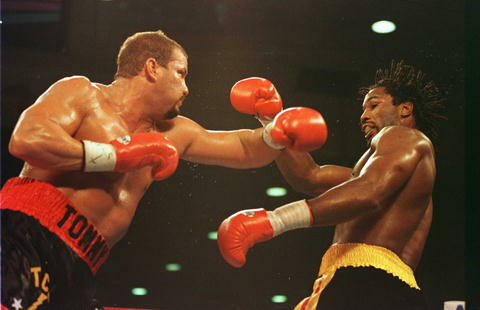 As that fight proved, ‘‘The Duke,’’ with his vaunted left hook, remained a serious challenge for any heavyweight. 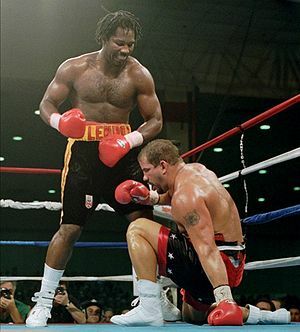 Also an ex-champion, the 27-1 Lewis was two wins removed from his shocking 1994 loss to Oliver McCall. He had surrendered his WBC belt in that defeat, and on his subsequent path to redemption beat relative unknowns Lionel Butler and Justin Fortune. The McCall loss hadn’t cast doubt on Lewis’ talent, merely his chin and concentration, and while it would be a gradual climb back to heavyweight eminence, a win against Morrison would expedite the ascent. Trainer Emanuel Steward still believed in Lewis, asserting he could beat any heavyweight in the world within eight rounds. Morrison had no illusions over who was the better boxer. 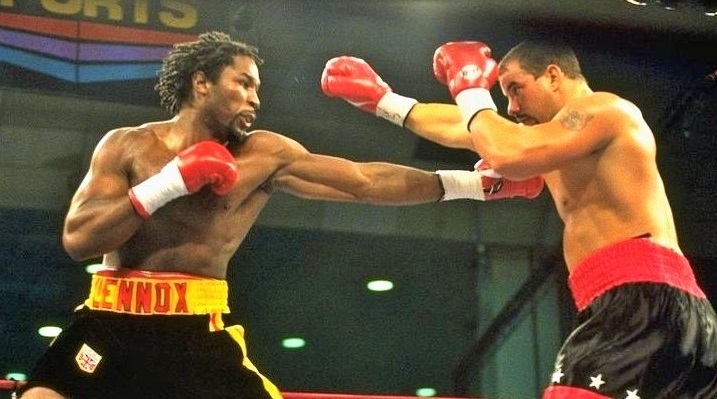 He acknowledged Lewis’ superior technical skill prior to the fight, admitting that to have any chance of winning he had to get on the inside to land his big hook. This would prove difficult. In the first two rounds the taller Lewis established his jab and consistently kept Morrison on the end of his longer punches. Midway through the second Tommy attempted to bull his way inside but took a well-timed counter left hook for his trouble that forced him to one knee and opened a cut at the corner of his right eye. So much for getting on the inside. In round three it was clear the knockdown had discouraged Morrison and he was reduced to feebly gesturing while out of punching range and eating jab after jab. Against Foreman, he had fought cleverly, slipping punches before moving inside the larger man’s reach, but against the quicker Lewis he remained a timid target. By the fourth his left eye had begun to swell up, making his situation more desperate, and by the fifth it became evident to all that Morrison had no chance of winning. With his vision reduced by the swellings around his eyes, the only hope left was a lucky shot on Lewis’ chin which, given how well Lennox was boxing, was no hope at all. At the end of the round, Lewis connected with what Jim Lampley termed a ‘monumental uppercut’ that sent Morrison down again. ‘The Duke’ survived to hear the bell and between rounds was asked whether he could continue. ‘I’ve still got my hook,’ he said. A series of jabs floored Tommy again in the sixth and while, as in the two previous knockdowns, Morrison rose immediately, the difference now was that his eyes were almost swollen shut. A thunderous left hook scored knockdown number four and referee Mills Lane stopped the fight. Larry Merchant called Lewis’ performance ‘perfect,’ and it was difficult to argue: his impeccable defense, precise jab, impressive ring awareness and tremendous power were evidence that he had, like never before, put it all together. The following February, Morrison tested positive for HIV, which effectively ended his career. His life became a sad and sordid tale. Over the next decade he faced various charges for weapons offences, car accidents, narcotics and multiple DUI arrests. Lewis meanwhile went on to win more world titles and earn millions of dollars in battles with Hasim Rahman, Evander Holyfield, Mike Tyson and Vitali Klitschko. It’s almost as if Lewis vs Morrison had been not so much a prizefight but something far more profound, a contest to determine who in the years ahead would win Fortune’s favour, and who would be its wretch. Morrison long denied he had HIV, claiming his test results were false positives. His health said otherwise, and in an interview with ESPN in late August, 2013, Morrison’s mother said that her son, who had been bedridden for almost a year and was experiencing severe organ failure, had “full blown AIDS”. His physical degeneration was an incredibly sad conclusion to a life of accomplishment, combustion, and recklessness. A week after the ESPN article appeared Morrison succumbed to his sickness. He was 44.